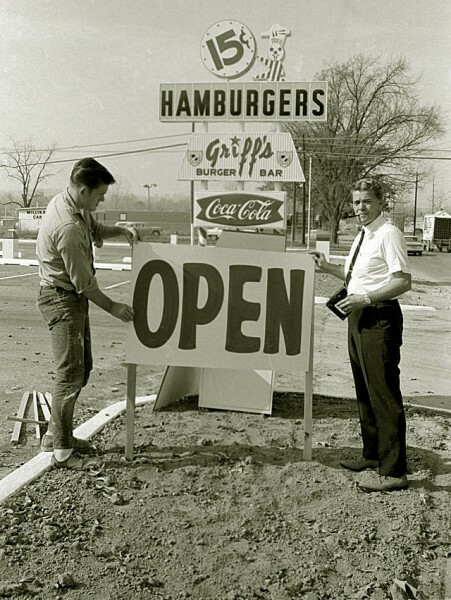 This must have been the grand opening of Griff’s Burger Bar. I don’t have any idea who the two men are or the exact date it was taken. I’m going to guess sometime between 1966 and 1968. Millikan Car Lot is in the background. There was a story in the August 12, 1968, Missourian that reported that four wheel covers, valued at $138, were stolen from a vehicle at Millikan Car Lot, 1803 Independence. Based on that, Griff’s must have been the the eatery at Caruthers and Independence. I didn’t see any mention of the opening, but the Google archive index may have missed it. A couple of want ads looking for night managers ran in 1966 and 1969. My wife and I would go to Griff’s when I was in college and we were closely watching our pennies. We would each get a sandwich and a soda for a total of 90 cents plus 3 cents tax. I believe it became Rich’s Drive-In circa 1972. I must have been living in lala land at this time because this is just foreign to me! Actually I might have been living in Rolla and that was lala land!! But was back in Cape in 1968. Must not have had a Griffs Burger. I LOVE the wedding announcement that you posted with this story!! I had to know if those two kids from good German stock made it!! Leroy and Laura Mae did live long and prosper, at least their 40th anniversary and were given a hearty congratulations by the Missouri House of Representatives in 2008. Be it further resolved that the Chief Clerk of the Missouri House of Representatives be instructed to prepare a properly inscribed copy of this resolution for Mr. and Mrs. Leroy Friedhof. I, Rod Jetton, Speaker of the House of Representatives, Ninety-fourth General Assembly, Second Regular Session, do certify that the above is a true and correct copy of House Resolution No. 4248, adopted September 29, 2008. Thanks for providing this update about the Friedhofs. That’s always the danger in rooting around, particularly if you don’t – or can’t – follow the story all the way to the end. In this case, I’m glad I left it in. After Griff’s opened, a large volume of Central students would frequent Griff’s (on the southeast corner of Sheridan Drive and Independence; Caruthers ended at Independence) for a lunch other than that offered in the cafeteria. Between McDonald’s and Griff’s, the volume of students leaving the campus during the noon hour must have become to great because a closed campus policy was later enacted. Does anyone but me remember a short-lived trampoline center at this intersection? Seems like the trampolines were over pits in the ground…but maybe my memory is that foggy? I never participated. I wonder if you have a photo of it, Ken. A trampoline center, bringing the latest sports development to Cape Girardeau, is set to open at Independence Street and Sheridan Drive for the labor Day weekend; 10 trampolines will be placed in parallel rows facing Independence; they will be ground level over pits 36 inches deep. For Larry Points – Your memory of the trampoline center at Independence and Sheridan is correct including the trampolines being over holes in the ground. My husband worked at Griffs for about ten days in 1966. He worked the front counter taking orders on paper slips and making change with a manual till. The third shift had to do the clean up on their own time at 11 p.m. or so. Don then moved on that summer to working the brush crew for Missouri Utilities and got poison ivy big-time. At various times, this Independence Street area had putt-putt golf and trampoline centers. I remember the trampoline pits very well. After a night of jumping on them I found muscles I didn’t know I had, and I thought I was in pretty good shape from working in the meat department at Ward’s Big Star Market. Sorry your comment didn’t show up right away. The blog has a spam filter that is usually pretty good at snagging bad stuff. For some reason or another, when I was in the process of deleting the 82 pieces of spam that had come in overnight, I saw your message right in the middle of it (note to self: don’t just empty the bucket without checking). Funny how fads came and went in Cape: Hula Hoops, go-cart tracks, mini-golf and trampolines. Hi…My name is Brad Kasten, Central High Class of ’67. I worked at Griff’s from the spring of ’66 through the summer of ’67. I then left for school at Rolla. I can answer the question of “Who are the gentlemen in the photo?”….. The guy on the left is Stanley Seabaugh and the other person is Jack Klover, owner of Griff’s Burger Bar. Jack lived in southern Illinois and Stanley was Jack’s dayshift manager. I made 50 cents an hour when I started at Griff’s and within the next six months got two raises and was making $1.00 an hour. I thought I was in heaven. I bought my 1st motorcycle while working there (a 160cc Honda Scrambler). If you remember, the place was shaped like an “A” frame and when business was slow, we had contests of who could climb up the sides of the metal roof to the top of the building the fastest. I’ve got a million stories about the good times we had……too many to share here! I remember going to griff’s Burger Bar for lunch many a time in late 67 and through 68. I was a Sophmore at central and I would walk over to griff’s and have a couple of Hamburgers at lunch. We could go off Campus and after McDonald’s opened up we mostly went out to eat and drove around cape until it was time to go to class again. Across from Griff’s was Clyde Sams used car lot and that’s where I got the car I drove in my Senior year at Central. But those times of going to griff’s and getting those low priced burgers is a great memory. I don’t remember Griff’s Burger Bar at all. Color me oblivious, or maybe I was living in Denver, CO then! My grandson is disappointed. I asked him to pull out his brand-new box of school Crayons and hand me Oblivious, but it was missing. What color can I substitute? I, too, worked at Griff’s (or Rich’s, possibly). It was my very first job!!! I was so excited. I went there for lunch everyday while at Cape Central. I would always ask them “Can I work here?” They said not until you’re 16 years old. So, on my 16th birthday I showed up and got my first job. I also remember the trampolines. I thought that was the coolest thing. Across the street from the trampolines was a little car lot. My dad bought me a little Cushman motor scooter there and I drove it to work at Griff’s (or Rich’s) and, later, to the the A&W on ?Kingshighway? I believe Larry Haertling and Ronnie Werner owned the trampoline center on the corner of Sheridan and Independence. I ALSO WORKED AT GRIFFS IN 1965, OR 66 MY SENIOR YEAR . GREAT PLACE FOR A KID TO WORK . LOTS OF GOOD MEMORIES. JIM JAMES WAS MY BOSS, JOHN ERVIN , ED GARDNER & STEVE COMPASS ALSO WORKED THERE. WENT TO ST LOUIS TO WORK FOR MCDONNALD AIRCRAFT WHEN I FINISHED SCHOOL. THERE WAS A MOTORCYCLE RENTAL PLACE ON THE CORNER OF BROADWAY, & KINGSHIGHWAY. ONE DAY JIM RENTED ALL OF US A BIKE , HAD A GREAT TIME..
Doug, We worked there when it was Rich’s. My brother was the manager here for Rich. Actually it was still owned by the owner of Griff’s at that time. They named it Rich’s. Then Rich went on to build hisown place across the street. I made 65 cents an hour and lasted about a month before I quit. If anyone has a picture of the actual Griff’s Burger Bar please let me know. My dad Ottis help build it and I remember it some, but we have no pictures of it.